Well, it's the post-last London 'Subterranea' show review ! Subterranea ! This was now the fourth time that I have seen Subterranea, and there were times when I thought that it was the best that they have played it. The mixing was pretty good - the drums sounded absolutely fantastic ! 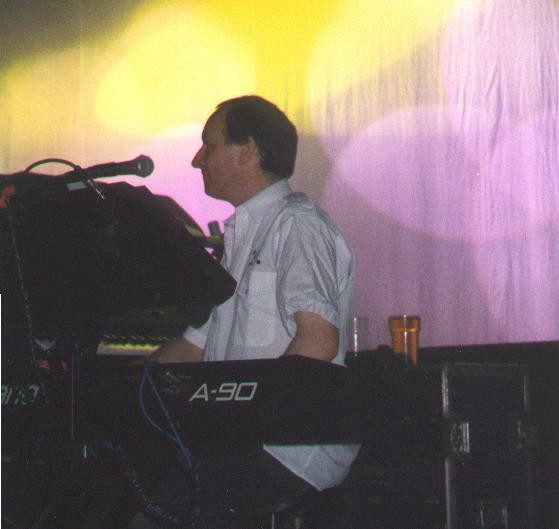 Maybe it wasn't quite loud enough, and there were a couple of occasions when the keyboards were a bit low in the mix (well, I would say that - I'm a keyboard player myself !). They employed the use this time of their real life sax player, Tony Wright (spelling ?) to play his bits. Mind you, it was slightly offputting with him pacing around a bit before his bit in Subterranea. There were some fantastic new bits. I thought that the final bit of the initial film with Pete running 'through the corridors' looked new. This was a great bit - a real tingle factor, as you could feel the tension in the air. There appeared to be other new back drop projections. The 'Murdering Angel of Death' bit was absolutely captivating, as usual. It was played differently again this time, with Pete's pursuer appearing on the back walkway by jumping onto it, and 'controlling' Pete from there. There was then a short game of cat & mouse before he was killed. Brilliantly theatrical ! 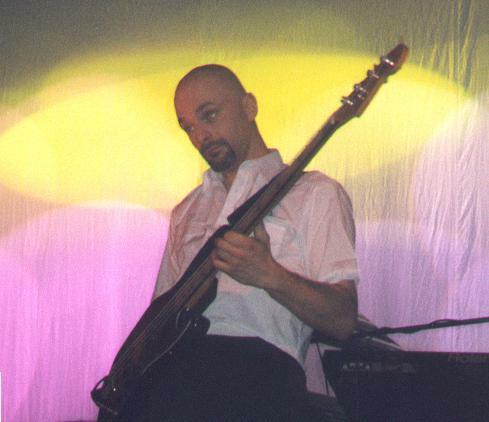 There was some gorgeous fretless bass from Mr Jowitt himself in Speak My Name & Capricorn. Unsolid Ground has now been changed and it has 'an ending'. Could this be for future use in gigs independently ? Mike played the acoustic guitar in Speak My Name, although the initial level was rather too high, causing some of the audience to jump ! And then in The Narrow Margin, through the flames that were licking on the screen could be made out the terrifying leather mask that Pete wore during his killing season. And then it was all over - boo hoo. Tremendous stuff, and everyone on stage seemed to be really enjoying themselves. Oh well. I really don't like this song, and I wish they wouldn't play it any more ! Still, there you go !! Having being brought back onto the stage again, Pete explained that they had expected to finish there, but that they would play one more number. Words were exchanged between Pete & Martin. 'Do you have a sound that could approximate what we need ?" Martin : "No !" So, we were asked to substitute the sounds for the real sounds ! The Last Human Gateway !!!!!!!!!! Completely unrehearsed, it still sounded absolutely fabulous !!! Doesn't this show just how professional the band are ? I bought The Lost Attic, the rarities album. Suffice to say that the presentation of the CD is first class. Some beautiful Peter Nicholls artwork (a dot picture, in the style of 'Tales..') on the cover. The booklet is packed with lyrics, quotes from the band, great pictures, etc. As my mate said, it's a far cry from 'J'ai Pollette D'Arnu !'. As you can imagine ! According to the original time schedule the soundcheck was supposed to take place between 5 and 7 PM. Strange enough, when I walked in at 5 there wasn't a single instrument on stage. Oggie and Mike were just setting up the gauze screen. Most of the crew was present but there was no sign of Martin, who had part of the equipment in his van. While Oggie, Lol, Andy and Lee were adjusting bits and pieces of the light and video show I had a quick chat with Dene, who was busy taking pictures and uploading them for his IQ Internet special. The Met itself was a very interesting venue indeed. The stage was quite wide and basically took up the full width of the concert hall. A sold out gig would hold about 300 people, as was the case with tonight's gig. I really like The Met's policy in this; 'sold out' here means that you can still move your limbs and reach the bar for a drink. At the back of the hall was a scaffold like construction which enabled the light and sound crew to have a good view of the stage over the heads of the crowd. The sound proved to be quite good later that night, so I can only conclude that The Met is a very nice venue indeed. The staff was also very professional and some of them wore headsets to communicate with each other. Unfortunately on a different frequency than the crew were using, so they could not use the system to order more pints of lager. It must have been well past 6 PM when Martin arrived with the van. It had taken him 7 hours to get to Bury and he had been stuck in traffic jams between Birmingham and Manchester. Peter arrived about the same time with some amazing new merchandise (fabulous fleece shirts !). There was also another guy who arrived with Martin and looked like he'd been pulled right of the street and seemed to walk around with a cigarette permanently fixed in the corner of his mouth. This later turned out to be sax player Tony Wright who played on several tracks in Subterranea, as well as the encore Human Nature. We unloaded the truck and the band and crew began setting up the drums and keyboards while time was quickly ticking away. During the process it appeared that Mike's guitar synth was missing. The last time it had been spotted was on stage at the Astoria, so the assumption is that it must have been stolen. Mike had an older guitar synth with him, but they were not sure if it would work with his current guitar. 15 minutes later the doors to the hall were opened and people poured in. It must have been between 9.15 and 9.30 when the show started and I can assure you that I was expecting it to become a complete disaster. Man, was I in for a surprise ! It only took Rob half of Overture to get the sound adjusted and besides some minor problems the sound went very well for the rest of the gig. [Additional note: when I discussed The Met's gig with Rob in Tilburg he said that it had been one of his worst shows ever. Lots of things had appearently gone wrong. This only adds to my respect for the crew; I hadn't really noticed any major problems]. Since the last time I saw the show (April 98) some slight enhancements had been made. First of all, Peter's acting had improved even more. At certain points in the show the look on his face was so evil and paranoid that you'd almost think something must have snapped under the pressure of the gig. During Subterranea new moving lights were introduced: spinning new IQ logos (you know, the square with the circle and dots). During Sleepless Incidental Pete was wearing a blindfold and the ending of Unsolid Ground been changed. The sides of the stage were very easily accessible at The Met, which enabled me to see the show from behind the screen and join roadie Mark for a couple of beers ('This is a great job Mark, drinking beer while watching your employer do all the hard work up there. I wish I could do that with my boss'). It also enabled John Jowitt to get off the stage during the bass-less parts and walk into the audience to watch the show, which was quite a hilarious sight ('Do you like it from this side John ?'). The whole performance went very well and it was definitely the best out of 3 Subterranea shows I've seen so far. When I later spoke with Neil and Sam they assured me that this one was even better than the one in The Astoria in March. However, I know that floor manager Andy Labrow really preferred London. During the encores all tension had disappeared and it was time for some fun. I shortly replaced Mark, handing over John's bass while Mark went to get some fresh pints. During The Wake we were jumping at stage left like berserk rabbits and there even was a moment where Mark pulled down his pants to 'moon' the band ! John came back on stage for one of the encores growling and shouting as if he was about to eat someone. His adrenaline must have been on a real high by then. For the last encore Martin walked back on stage on his own, took his place behind the keyboards and kindly asked: 'Can I get a band on stage? ', resulting in a high energy version of Awake and Nervous. What a marvelous evening ! After the show I had some small talk with band and crew and met Sam and Neil, as well as Martin's better half Chris and Juan and Rosa from Chili. By that time the combination of getting up at four in the morning after only 4 hours of sleep, not having any dinner (which was quite stupid of me because I must have known better after the Fragile gig in London) and downing a number of delicious pints (I really prefer the pints above the small Dutch glasses) started to get to me. While my English must have become dodgier by the minute I had the feeling I was about to fall over, so I said bye to everybody and headed back to the hotel around 1 AM. Getting up at 6 AM I was horrified to discover that I had forgotten to take the aspirins with me ! I can assure you, wandering around airports and train stations with a hangover is not my idea of quality time. But then again, it was definitely worth it. Pete, John, Widge, Mike, Cookie, Tony, other Tony, Oggie, Andy, Rob, Lee, Kala, Mark, Lol and everybody I might have forgotten: Thumb up ! Another job well done ! 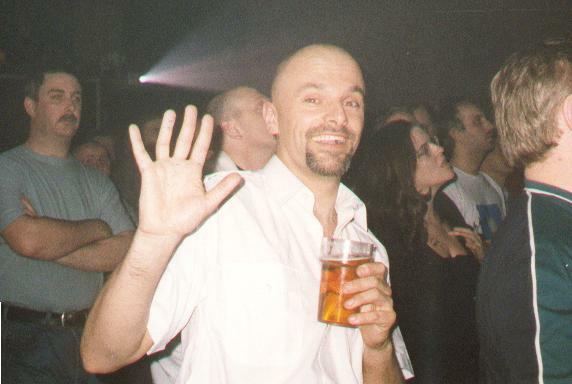 For me it was the first time I went to a gig in the new 013 venue in Tilburg - the first ever venue to be built for the sole purpose of rock-concerts. And well designed it is! The big hall, where IQ played, had a gradually rising floor, which enabled everybody an excellent view of the stage. There were no seats though, it was standing only. We found ourselves an excellent spot next to the mixing desk, about halfway in the hall, with an excellent view (thanks to the sloped floor) on the stage. It was also fun to hear the soung engineers discussing about what kind of music to play before the show started. The opted for a CD handed to them by tourmanager Andy Labrow with the message: "This is Mike's and it's really good. No, it is *not* house..."
After about half an hour of waiting and chatting with other DPRPeople (more than half the team was present) Andy Labrow came onstage to give a hilarious introduction to the show. He explained to us that this was to be the very last Subterranea show, which was to be filmed for future video release by a professional multi-camera film crew. (in case we hadn't noticed the cameras yet) He taught us how to cheer and applaud and to make sure we did it exactly at the right moments, in order not to spoil the video. The audience participation continued with a couple of applause-rehearsals and even a short course on how to give the person next to you a massage. Andy left and the show was about to start. Personally I don't like professional filming at a concert as this always requires extra lights to shine at the audience. (looks better on the screen than a black hole I guess) This gig proved no exception and I found myself standing under a bunch of bright blue spotlight, which completely drowned out the projections on the gauze screen, which therefore wasn't as effective as previous times I had seen the show. The band had been up since 6 that morning and had already played the entire show that afternoon for recording without audience and it showed that they were getting tired. They weren't playing as tight as normally, especially Mike missed a few notes during the first few songs and when Pete started singing Provider you could hear how his voice had suffered from the long day. Added to that there was a very irritating buzz, and I saw the sound engineers pulling plugs out and back in while turning switching on their mixing desk, trying to find out what it was. The show had evolved even further since the last time: The light-bars that were projected on Pete during Provider were different (although I like the old one better) and the coloured dots that were originally projected on the gauze screen during the opening of the title track were replaced by coloured spinning IQ logos. They had also brought a saxophonist along with them for the saxophone parts in Subterranea and Capricorn. There was also some new footage added to the projections, like a bit during Overture where you see Pete running through a locker room. At the end of Sleepless Incidental where Pete enters the church a leaded window was projected on the backdrop. Because Pete wore white clothes the projection also showed on his clothes, with the image of Christ right on his chest. I am not sure whether this was intentional, but it was very effective. Pete's acting on the whole had improved, from startled looks in Subterranea, to painful screams and a blindfold in Sleepless Incidental. Also when portraying the priest in Failsafe Pete wore shades similar to the ones Bono (U2 leadsinger -ed.) had used when portraying The Fly in the similar video and stage act. An act that had a similar meaning to the priest Pete portrays, namely the hypocritical double-faced role of the church. Intentional or no, I thought it worked well. As Andy Labrow had explained, there was a *slight* possibility that something would go wrong, and that slight possibility happened during Failsafe when one of the lights above the stage constantly showed the wrong colours. The show was stopped right after Failsafe and the lamp had to be taken down for inspection. While the crew was repairing the light, Mike started playing the instrumental My old man's a dustman from their first album Tales from the Lush Attic. He continued with some Latin-sounding bars, which had the rest of the band falling in for the IQ let's-have-some-fun-trademark: the rumba version of Came Down. The bands weren't let down at all by the problems, and were still in an excellent mood. Actually, I think the break was good to lessen the tension and stress. Pete came back to the microphone to tell us that it would take a bit longer than expected to fix the light and that it was time for the band to play some unrehearsed requests from the audience. The request for Widow's Peak was laid down after Mike had played the guitar intro and the whole band kicked in with Out of nowhere, which of course also included the ABBA cover Mama Mia. It was a bit strange seeing the band enjoying themselves and running around the stage, while at the back of the stage the crew was repairing the light. After this bit of fun Pete had a chat with the crew again and came back with the message: "I have some good news, and I have some bad news�. The bad news is that the light is still broke, and it needs to come off completely for replacement. This will take a while longer. The good news is that you have just had a free 20 minutes of IQ, because we have to start right from the start again�." After about 20 minutes all the problems had been fixed and the band was ready to start again. They started with the title track again, so in the end it was only 3 songs that had been played twice that evening. Further problems stayed out and the band seemed much more at ease after the break and Pete's acting seemed even more natural. The already lugubrious act during Infernal Chorus had improved even more since last time. 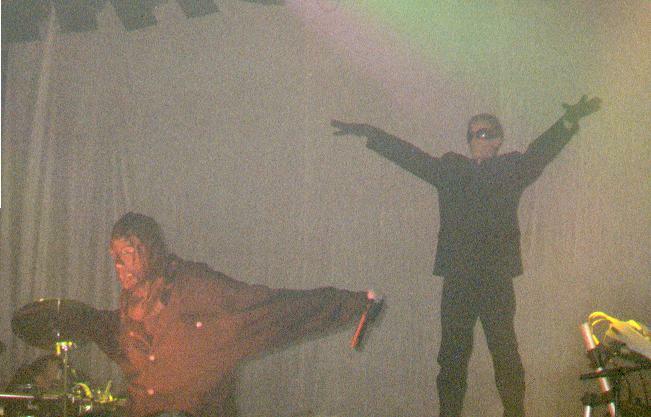 It started the same as last tour: Pete came onstage wearing his leather mask, singing the first verse when one of Mockenrue's sidekicks came onstage behind him (ironically wearing the same "The Fly" shades). With perfect timing Pete - at the front of the stage - got pulled back by invisible strings Mockenrue's agent at the back of the stage pulled - Brilliant! And when Pete killed him all stage lights turned read, creating a very spooky effect. This was a really magnificent piece of acting (and timing) one rarely sees at rock concerts. I bet it'll look great on the video. The next song, King of Fools was a bit spoiled because the projector that was to show Pete's face on the screen was not aimed very well, and Pete ended up at the right bottom corner of the screen. The crew tried lifting the projector a bit higher, but the image kept creeping down. The rest of the show was played perfectly and the theatrics had mainly stayed the same as previous shows. After a magnificent Narrow Margin the audience stayed silent for a few moments after the final "Provider, are you inside or am I?" before the loud applause took the virtual roof off the building. This ended the very last Subterranea performance for the band. It was certainly not their best (I still prefer the Amsterdam show of last year) but what can you expect after such an exhausting day, and the stress of being filmed and all. When the band came back onstage for an encore, you could clearly see that the tension had gone. Although the cameras were still rolling the band played a lot more relaxed than before. Tony Wright, the saxophonist, joined them once more for some solos during the new version of Human Nature which nowadays starts about halfway through the song with an extended guitar-riff. During one of the guitarsolos Mike broke a string, and for a moment I feared that once again the show had to be stopped. Fortunately both the band and the director realised that this was an encore, and not part of the actual show anymore, so the band was allowed to play on. I have never really been impressed with IQ's choice of encores. Although they often play a lot (4 at this show, and 5 at the two previous shows I've seen) their choice of songs is always somewhat limited (with the exception of the full rendition of The Last Human Gateway in London) and this time they had opted for two more songs which have been the encores at every single IQ gig I have seen so far: The Wake and Awake and Nervous (not to mention Out of Nowhere/Mama Mia during the break). Fortunately the band decided to come back onstage for a fourth, and final encore: Widow's Peak, which was played flawlessly, despite the apparent tiredness of the band. It was also funny when the band came back onstage for that last time that John Jowitt played a few notes on his bass, which had Pete immediately putting a hand behind his ear, gesturing "What's that I hear". So John played it once more and immediately the rest of the band kicked in with the rumba version of Came Down. It is always so funny when they play that, because it is always someone else who starts it. After the show had finished we were treated with some very loud "Mike House" of which I can only say that I'm very glad that he has never put that on an IQ release... yet! Altogether I have mixed feelings about the gig. The performance was good, yet not perfect and I've seen them play better and the encores were not really special (apart from Widow's Peak). Also the presence of the cameras in front of the stage, and the bright lights shining on the audience completely took away the entire atmosphere of a live performance. On the other hand, I was glad I could see the Subterranea show just one more time (a year after the last time I'd seen it and a year and a half after the first performance). And when the video comes out, at least I can then say that I was present at this important chapter in IQ's history. - Andy Labrow's tour diary. - The Met, Bury, UK, September 5th 1997. - The Met, Bury, UK, September 5th 1997. Another review. - Amalgame, Yverdon-Les Bains, France, April 2nd, 1998. 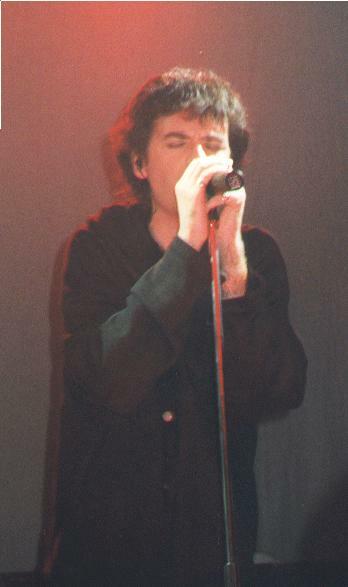 - Various pictures from the German leg of the tour in April 1998. 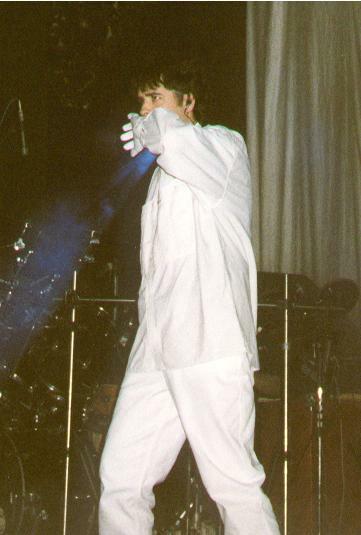 - Photo Special of the Bury show on April 1st, 1999. - 013, Tilburg, The Netherlands, April 4th, 1999.